The best way to accomplish ministry is as a team. God designed the church to function interdependently so teamwork only makes sense. 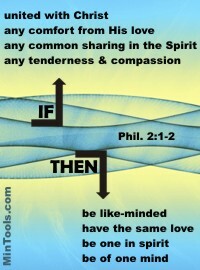 To do ministry God’s way, we must follow His design for the Body of Christ which includes interdependence. That’s what ministry teamwork is about. Doing ministry God’s way leads to the growth of the Body so it only makes sense that we intentionally work to enhance team building within our churches and ministries. When we make it our goal to get on page with God and please Him (Col. 1:10) rather than promoting personal agendas to please ourselves, we are better able to serve interdependently, as a team, with one another. As we get to know, understand, and accept one another on the team (Rom. 15:7), we are better able to function from a place of true fellowship. When we focus on who team members are, and not just on what they do, it helps us to be better able to deal with issues that arise “for out of the overflow of the heart the mouth speaks” (Matt. 12:34) and the heart “is the wellspring of life” (Prov. 4:23). As we become more and more of a true team, functioning interdependently with everyone doing their part, we tend to find ourselves getting beyond mere programming, planning projects, or accomplishing tasks. We focus on true ministry with fellow team members and those we serve. Whether on an official ministry team or believers working alongside of each other without being termed a ministry team, we all need to learn teamwork and team building if we’re going to do ministry God’s way. Ministry teamwork is about following God’s design for the Body of Christ to function interdependently with each member doing his/her part. Body Life: What is It? For true interdependence, team leaders must serve among, as servants and shepherds, to guide and encourage, not from a position of superiority. Each and every team member, no matter what their gifts, abilities, or responsibilities, must be seen as valuable so everyone’s participation matters. These verses remind us that it isn’t just about the task we have to complete as a team but the relationships we have with one another. Working on the same goal, or purpose, doesn’t make us one. As the above verses suggest, we’re to be one in spirit as well as purpose. So, even when we disagree, we can still be encouraged. Even when our idea is set aside, we can be comforted. How is that possible? We find our common ground in the Lord, united with Christ. We protect our commonality by exercising His love. We have fellowship with one another because we’re in fellowship with the Spirit. With all of that in place, we can experience unity out of diversity — being one in spirit and purpose. If we try to find common ground in our own opinions or ideas, our diversity could get in the way. Rather, together, as a team, we seek God’s wisdom, His solution. We make getting on page with God more important than pushing our personal agendas. So much can go wrong when a group of people with different personalities, learning styles, backgrounds, and opinions try to work together. If we’re going to be like-minded and of one spirit and purpose, we must find fellowship with one another in the Lord and the grace He extends. If we rely on the goodness of people in order to work well together, our diversity will get us in trouble. To overlook each other’s idiosyncrasies and work through conflict, we need to fall back on God’s love and forgiveness, His grace. When we do, we’ll find the tenderness and compassion to work with people we might not normally be drawn toward as friends. If fellowship must be rooted in the common ground and common grace that can only be found in what we all share in our Lord, then our meetings need to include time to focus on Him, not just the task at hand. Do we take time to pray together? Do we use God’s Word as our filter for making decisions? Do we point each other to His character and ways as the grid through we function? One way we can do that is to have a short devotional time together. You could keep it casual by having team members share something God taught them from His Word since you last met. Or, members could take turns coming prepared to lead this time with Scripture they believe would be encouraging or relevant to the task at hand. You might work through a study together but must remember not to get so caught up in it that you become a Bible study group rather than a ministry team with a mission to accomplish. The Ministry Worker’s Devotional: A Mighty Fortress Is Our God could be a tool to use with a ministry team that centers on the very character and nature of God as the resources we need for effective ministry. Whether we use devotionals or not in our meetings, the basis for our fellowship must consistently and regularly be remembered and reinforced. That could be done through spontaneous moments of prayer, especially when we find ourselves at an impasse. It could happen by purposefully asking the right kinds of questions as we flow through our agenda, ones that challenge us to consider if what we’re planning and doing lines up with God and His Word. To remedy attacks on the church for being too “worldly” or “business-like” in how it functions, some have re-labeled what they do. For example, . . . The terminology might “sound” less worldly or business-like but have the activities themselves changed to be more godly or biblical-like? Using the same examples, . . .
What one calls a job description could line up more with God’s design and desires for ministry than what someone else re-labeled a ministry description. A ministry description or team can be mired in just as worldly or business-like organizational structure as a job description or committee. Name changes can be good if they truly depict what is happening. However, if you change the label but not the reason for its existence or the way it functions, all you have is a name change. We need to get beyond labels to truly being the Church God calls us to be. We need ask why something isn’t working and first address those issues. Questions we might ask regarding the same examples already used could be . 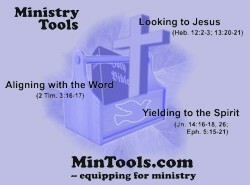 . .
What is it about your job descriptions that doesn’t promote a ministry mindset? What is it about your committees that isn’t conducive to a unified advancement toward the common good and growth of the Body? Once you resolve those issues, then you might want to consider a name change to better reflect what you do. The examples used in this post are only two of many ways we as a church try to repackage the same old thing. But, since I used them as examples, let me point you to some articles that might help in these areas. Job Descriptions Reflect God’s Heart for the Church? Job Descriptions Reflect a Need for God’s Power? As with a physical body, the Body of Christ must work together interdependently, as a team, to function with the kind of unity described in the above verses. Functioning like a team does not happen automatically just because we are Christians, part of His Church. Team members need certain qualities built within them that help them truly engage in such fellowship. Consequently, team leaders must promote these qualities. But, what will it take for team leaders to turn into team builders? While providing practical ideas is always good, team leaders need to be reminded of the tools they already have constantly available to them — the cross of Jesus which brings us together into one body, the Word which instructs us on how to live within God’s design, and the Spirit who enables us. Jesus’ example of servanthood is the best pattern we will ever have for functioning as a team (Jn. 13:3-15; Phil. 2:1-11). When we learn such selflessness, willing to lay aside our rights for the good of others, then we too can be an example. We will be able to say, as the Apostle Paul said, “Follow my example, as I follow the example of Christ” (1 Cor. 11:1). Knowing the tools it will take for us to be the Body God intends us to be and having good examples of it doesn’t always translate into living it out. We need to have such a trust in God that His ways are always right and that He is great enough and powerful enough to change us and those we serve, that it moves us to action. Sometimes it helps to be able to interact with someone in whom God has developed the qualities essential to teamwork. We can learn from their experiences but also from their heart. Don’t assume the team will be unified and accepting of each other’s differences but rather provide pre-team training of what it takes to be on a team as well as continued trust-building exercises. Don’t expect people to merely attend meetings and give occasional input but rather truly give them authority to do their parts. Don’t let self-centered attitudes fester but rather point to the attitude and servant heart of Jesus as the standard for the team. Don’t forget the big picture and get lost in all the details but rather promote the development of perspective and an expectancy toward what God will do for the whole. When team leaders fulfill these responsibilities, it tends to build the qualities needed in team members to work as a unified group.